Both Aidan Mattox and Adrianna Papell have some gorgeous cocktail and evening gowns for this holiday season. If your petite, the strapless, halter and one-shoulder styles have a flattering fit. Aidan Mattox is available in sizes 0-14 at fine department stores, including Neiman Marcus, Bloomingdale's and Nordstrom. If your looking for a little sparkle and shine this holiday season, Adrianna Papell has some dazzling dresses, with all-over sequin or beading details. 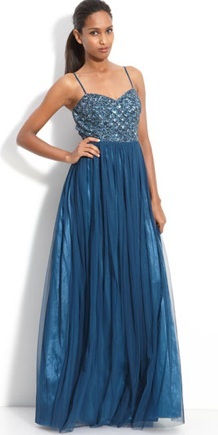 I always find Papell's gowns to have a gorgeous, accentuating fit, with a jeweled palette for a lot of color options. Adrianna Papell dresses range from sizes 2-16, with select dresses available in petites. You can find the collection at Nordstrom, Lord & Taylor, Macy's and Dillard's.